Hiro (Kyoto, Japan) on 27 April 2014 in Transportation and Portfolio. Quel chemin avec ce planches de bois sueprbe. with beautiful composiion, perspective, tone & lighting! Joli dans ces tons ! Nice capture, great processing. Nice photo job I like. 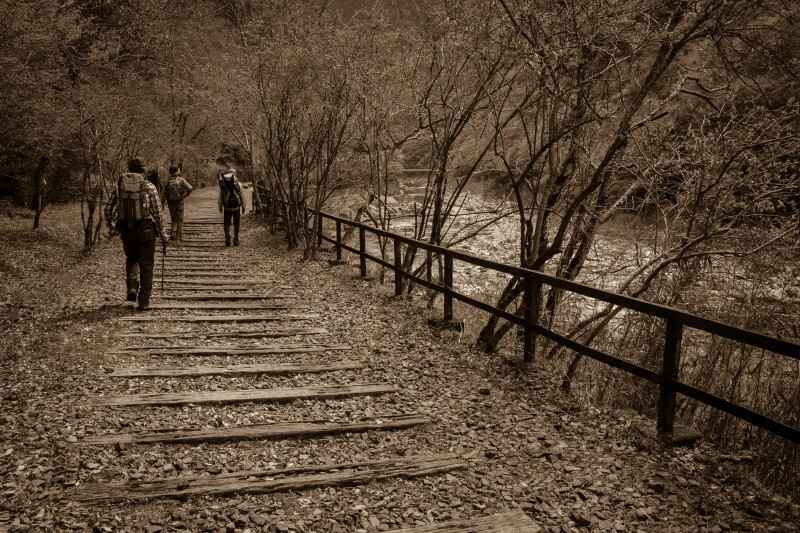 Excellent choice of sepia, great pictures, the composition is superb. Superb scene! Beautiful perspective and processing! How striking! And yet only the old decaying wood almost gone back to earth, helped by the sepia. Hikers following the path probably in appreciation. I love this mood and image, Hiro. 5 stars from me. Ah, the trekkers march onward beside the river. A grand adventure and cool shot. Very nice processing. We have stepped back in time. Great shot, love the treatment, excellent choice. Congratulations. Excellent little series and I really like the presentation here - good work. Inviting stroll & perspective is very nice !